The history of Zakayo is very touching while its appearance and behaviour mark one of the exciting moments that can be explored on Uganda Safaris and tours. Dating far back in time when he was kidnapped from his initial family and eventually surrendered to Government after the “owners” could not withstand it due to his aggressiveness; Zakayo has passed through the thick and thin including surviving in the run down zoo during the turbulent times of Amin. Amazingly, Zakayo is still living and now enjoys comfortably his evening years with his fans treating him to an exciting birth day event with a cake every year which is not only a moment of joy to him but also a move to raise awareness about Chimpanzee conservation and their significance among which include attracting world travellers to plan safaris to Uganda. On Thursday Oct 27th in the lush green of Budongo Island in the Uganda Wildlife Education Centre (UWEC) the former Entebbe Zoo; the Zakayo was treated to a sumptuous fruit cake amidst loud cheers from the patrons singing birth day song to commemorate his special day. The key cutting moment followed a conservation poem recite by Zoe Tushabe from Entebbe Education Centre and after Zakayo was through with his cake cutting moment, the patrons also cut their cake at the Budongo Island Pavilion with the UWEC Executive Director Mr. James Musinguzi and Mayor of Entebbe Godfrey Kiryowa taking lead. This Male Chimpanzee that retired from its Alpha position five (5) years ago is noted to have been rescued on June 10th 1964 in the Uganda tour destination of Semuliki National Park by a white man who attempted to raise him until June 19th 1976 when he handed Zakayo to Government. Though the soldiers used to tease the chimp at the zoo with alcohol and cigarettes, it is very fortunate that it did not acquire lung cancer which gives it hope for more years. It is recorded to be the first leader of Budongo Chimpanzee group which today boasts of Sixteen (16) members before it was succeeded by Matooke and Onapa respectively. 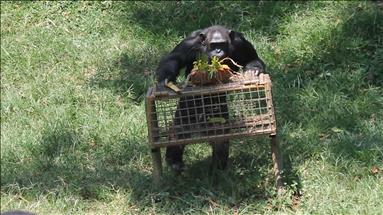 Zakayo, according to Jimmy Awany – the Curator, is a caring chimpanzee and at times adopts juveniles creating a favourable environment for integration. During his reign, Zakayo is recorded to have sired Shaka. Uganda is among the countries in the world with high Chimpanzee Populations thriving in her lush tropical forests of Budongo, Kibale, Semuliki, Kalinzu, Kyambura Gorge and the Ngamba Island Chimpanzee Sanctuary. The Chimpanzee trekking and Habituation are among the most sought after activities by travelers on Primate Safaris in Uganda Africa.